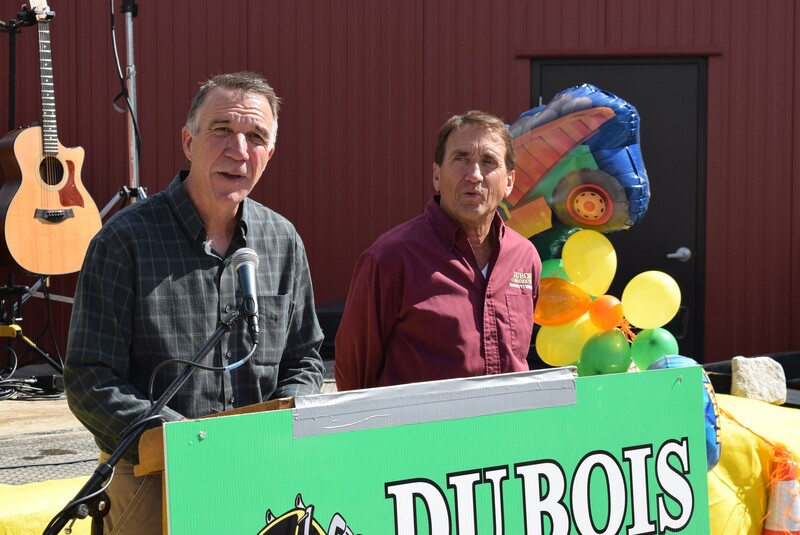 Republican gubernatorial candidate Phil Scott (left) announces he will sell his share in DuBois Construction if he’s elected governor, as co-owner Don DuBois looks on Saturday outside the company's Middlesex offices. Republican gubernatorial candidate Phil Scott will sell his share of the Middlesex excavation company he co-owns if he wins the November election, he told employees at a company party Saturday. “Should the people of our state hire me for this important job, I will sell my portion of the company before taking office and will therefore be completely separated from DuBois Construction,” Scott said, standing alongside his co-owner and cousin, Don DuBois. Scott and DuBois have co-owned the company for 30 years. Founded by DuBois’ father and uncles, it celebrated its 70th anniversary Saturday. The move comes after Scott faced criticism from opponents that a previous plan to create a blind trust would be insufficient to wall him off from a company that bids on state contracts. “At first, I thought a blind trust would work,” said Scott, who currently serves as lieutenant governor. After his Republican rival, retired Wall Street banker Bruce Lisman, slammed Scott over the issue during the primary election, he said he reconsidered. Scott said that if wins the election, DuBois Construction will buy his share of the business. He would not release a dollar figure for the potential transaction but said that it would be close to the figure he cited in a personal financial disclosure he released in May. In that document, he valued his 50 percent stake at $2.5 million. Scott also announced Saturday that Jeff Newton, who owns the Newton Construction trucking company in Barre, will become a partner in DuBois by the end of the year. Scott said he hired Newton about a year ago to become the company’s general manager after his campaign for governor began to interfere with his time on the job. 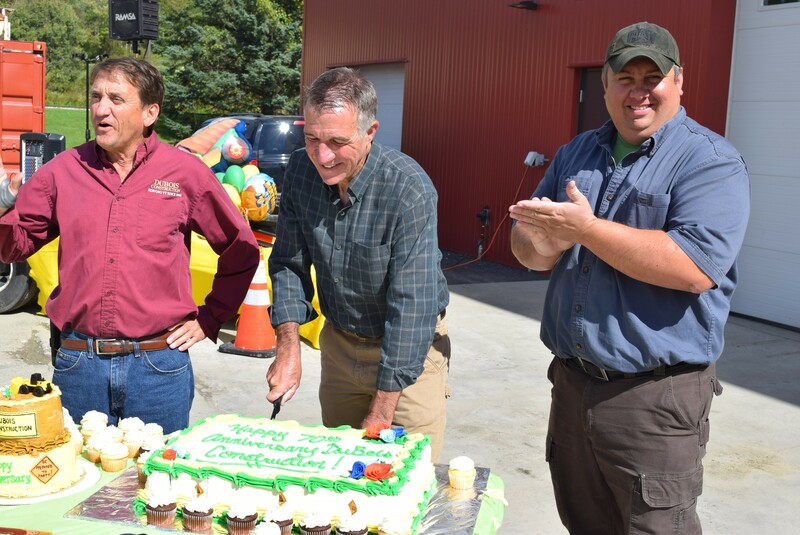 Republican gubernatorial candidate Phil Scott (center) cuts a cake commemorating DuBois Construction’s 70th anniversary, with co-owner Don DuBois (left) and new partner Jeff Newton Saturday. If Scott wins the election, DuBois and Newton will be co-owners. Scott said he has no plans to return to the company. Just before the August primary, which Scott won by a wide margin, Scott said that selling his stake in DuBois or forcing the company to stop doing business with the state were both impractical options. He said then that he and his lawyers had worked out a plan to place his portion of the company in a blind trust — a move he insisted would wall him off from decisions. “It’s all set and ready to go,” he said at the time, promising to release the plan shortly thereafter. But Lisman and the Vermont Democratic Party continued to argue that no trust could entirely separate Scott from the company and its profits. The LG said Saturday that he realized the issue wasn’t going away. “Either this, or DuBois stops doing business with the state,” she said. Scott, who’s served as lieutenant governor for six years, is competing with Democrat Sue Minter, former secretary of the Agency of Transportation, for the governor’s seat. Democratic Gov. Peter Shumlin is retiring after six years. DuBois said Saturday he’s happy with the arrangement. Newton said Saturday as he served hamburgers at the company picnic, that accountants are still working out the details of the transition. Scott indicated that Don DuBois would likely hold a majority share under the arrangement. During Saturday’s celebration, rows of yellow DuBois and red Newton trucks sat lined up facing each other in the DuBois parking lot. The companies have often worked together, Scott said, and he’s known Newton for many years. 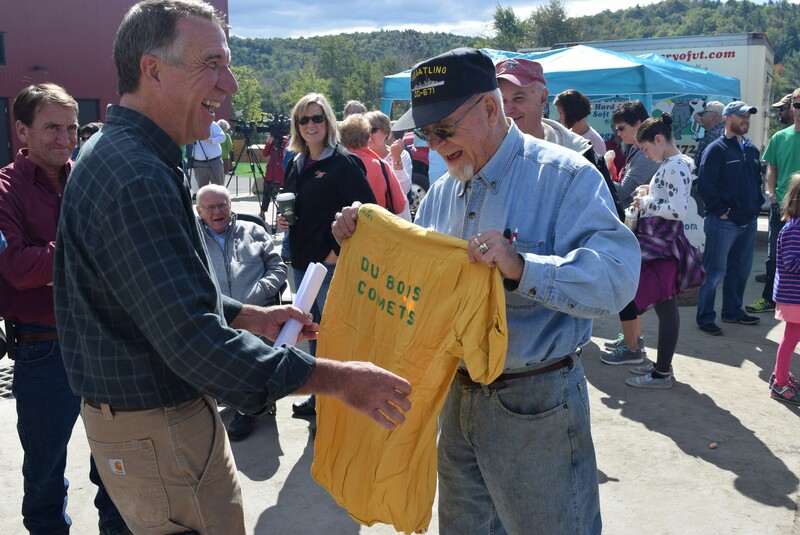 Mick Winter of Barre shows Phil Scott a DuBois bowling team T-shirt from the 1960s at the company’s party Saturday. Scott was in a unique position as a candidate for governor who owns a company that does some business with the state. Before becoming governor, Shumlin ran Putney Student Travel with his brother. The incumbent has said he plans to return to the company after leaving office. But because Putney Student Travel didn’t contract with the state, Shumlin didn’t face the same decision about severing ties with it. He told his employees, as he encouraged their families to try out some of the backhoes and excavators, that he’s always enjoyed working with the “toys” that fill the DuBois parking lot. Democratic gubernatorial nominee Sue Minter last month continued to outraise Republican Lt. Gov. Phil Scott, according to new disclosures filed with the Secretary of State’s Office, but a GOP super PAC more than made up the difference.